As with Project Horror, I decided to kick off Project Valentine with a block of classic movies. 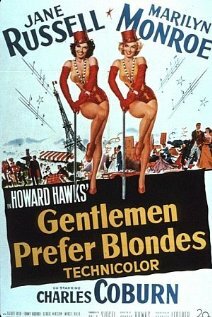 Somehow, I'd made it this far in my life without ever watching a Marilyn Monroe movie, and decided that I'd like to go ahead and change that with Gentlemen Prefer Blondes. This is one of those roles that's so iconic, so closely associated with the actress who played it, that it was a surprise to me to learn that this movie was made fairly early in Monroe's career. This, along with two other movies that came out in 1953, was her first true breakout role. At the time this was made, Jane Russell was actually the much bigger star. The studio wasn't sure if Monroe had what it took to be the lead in a movie, so they gave Russell top billing, and generated rumors that the two women couldn't stand each other in order to spark publicity. In truth, Russell and Monroe remained friends until Marilyn Monroe's death almost a decade later. Back in college I watched the movie 42nd Street with the girl I was seeing at the time, and we both noticed something - there really aren't that many movies made anymore about putting on a show, but classic Hollywood was swimming in them. Singing in the Rain, Kiss Me Kate, and on and on... Gentlemen Prefer Blondes isn't about that, but does set us up in the first scene with the knowledge that our heroines are cabaret performers, all the better to prepare us for the musical numbers to come. This was a great first movie to see Marilyn Monroe in. She is one of that small number of performers whose legend looms so large that you can't separate the performance from the legend. She really was much more than just a pretty face (although that was definitely one pretty face) - her comic timing and delivery was top notch. When she finally meets her potential father-in-law, she has my favorite line of the entire movie. Esmond Sr.: Have you got the nerve to tell me you don't want to marry my son for his money? Esmond Sr.: Then what do you want to marry him for? Lorelei Lee: I want to marry him for YOUR money. Because I am thoughtful, before I give my rating and lesson learned from this movie, first I'm going to put a little something for the ladies. I really enjoyed this movie. It's more comedy than romance, but it still had enough of a love story that I feel like it qualifies for Project Valentine. RATING - I give this one five Marilyns out of five. I actually didn't finish this one when I sat down to watch it one night, but I totally agree with you about Marilyn. Now you know why she adorns so many girls' dorm rooms, as she did mine! And that WAS one of my favorite lines! Did the blatent sterotypes of male beefcakes and women's "place in society" drive you or Courtney crazy? That's a major reason I gave up on it! I see what you're saying there, but it didn't really bother me. I think because every single character in the movie is SUCH a heightened stereotype, you know? The man whose wife Lorelei steals the tiara from isn't just British, he's the complete bumbling, "What, what? (huff puff)," bloviating stereotype of an Englishman. Their cabdriver in Paris isn't just French, he's decked out in a beret and does the thing where you kiss your bunched-up fingers to show approval. The only thing he's missing is a baguette.